The third generation Volvo XC70 2012 has been upgraded with a number of features including the latest user-friendly Volvo Sensus infotainment system, enhanced technology that makes driving even safer and more comfortable, and refined drivelines that offer higher performance and lower fuel consumption. The third generation Volvo XC70 is more refined than ever. A comfortable and luxurious appearance has been combined with top-class flexibility and an expressive design. The XC70 is a sophisticated and elegant car for an active urban life. Come the weekend and it transforms into a rugged partner for all kinds of exciting adventures. 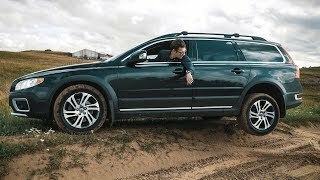 The XC70 has been upgraded with a number of features including the latest user-friendly Volvo Sensus infotainment system, enhanced technology that makes driving even safer and more comfortable, and refined drivelines that offer higher performance and lower fuel consumption. The model has a unique soft nose. This is characterised by a larger grille and headlamps. The dark-coloured body panels provide an exclusive, rugged impression, clearly signalling the car's dynamic capabilities. Moving to the side, the contrasting protective sections are supplemented with a chrome moulding at the bottom of the doors. The pronounced wheel housings are another design feature, contributing to the capable appearance. A number of design elements, like the framed side windows and the distinct shoulders, create a genuine estate car profile. The tailgate's upper section has a sportier forward-leaning stance. The tailgate overlaps the tail lamps, providing an even wider opening. The glass goes further down at the sides, enhancing rear view. The rails are integrated into the A-pillar mouldings. A new exterior features in Model Year 2012 is the redesigned headlamps. Volvo Sensus is an excellent example of how Volvo Cars refines the driver environment. All information is presented on a five-inch or seven-inch colour screen in the upper part of the centre stack. The screen is positioned high up to make it easy for the driver to keep his or hers eyes on the road. All the functions can be controlled via buttons built into the steering wheel or via touch buttons located just below the colour screen. The Bluetooth connection has been upgraded to allow not only hands-free phone conversations but also music streaming from a preferred Bluetooth enabled portable music player. Volvo is actually the only brand to offer Bluetooth music streaming throughout the entire vehicle range. New is also a mobile application that makes sure that the driver can stay in touch with the parked car via an iPhone or Android smart phone. The mobile application is an extension of Volvo On Call, which is presently available in 12 European countries plus Russia and Brazil. Now, the system has been reinvented. 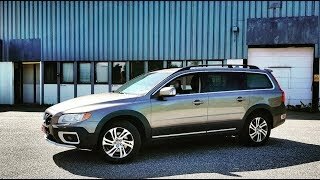 Owners of all new Volvos from Model Year 2012 with Volvo On Call can download the new application that opens up a range of connectivity possibilities. The mobile app is free and downloaded via the iPhone and Android application stores. The app is designed to offer the owner an intuitive, easy-to-use relationship with the car from a distance. The interior of the XC70 is an example of Scandinavian design at its best. Every little detail has been designed with a one hundred percent focus on both clean form and intelligent functionality. Comfort in the front seat features superb seats and ergonomically designed instruments - including an elegant, super-slim centre stack and an audio system of absolute world class. In addition to Sandstone Beige and Anthracite Black there is an Espresso Brown option where the warm dark colour of the seats, door panels and instrument panel contrasts with the sand-coloured detailing of the rest of the interior trim. There is also a new Blond highlight colours for the upholstery as well as a new three-spoke steering wheel, enhanced décor inlays and redesigned interior lighting. The integrated dual child booster cushions can be adjusted in two steps and the 40/20/40-split rear seat has integrated seat belts. The lightweight design of the rear backrest and the simple folding mechanism are other examples of improved functionality for passengers. Electrically folding rear seat headrests are also available in the XC70. Everything and everyone rides in first class. Even the luggage compartment and all its options and accessories have been designed to meet the very highest demands on luxury and intelligent functionality. Among the smart details in the luggage compartment is a storage space under the floor that is locked when the tailgate is shut. A power tailgate is an option. The car has been developed and balanced to give a first-class driving experience, based largely on pliant ride and secure road holding allied to high stability. Stability is particularly important when driving with many passengers and a lot of luggage. Thanks to the design of the body structure and the optimised use of different grades of high-strength steel, torsional rigidity was increased by no less than 15 percent compared to the previous XC70 model. The chassis technology has been further developed to provide even more stable and more controlled road manners. A lot of effort has also gone into features such as the suspension system and engine installation to ensure high-class comfort. 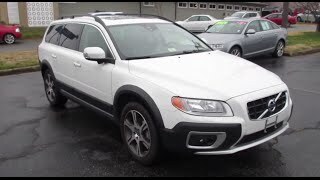 Several variants of the Volvo XC70 come All Wheel Drive. Using an electronically controlled hydraulic clutch, the AWD system distributes drive between the front and rear wheels to ensure the best possible road grip in all situations. The system features Instant Traction, which shifts drive at lightning speed from the front to the rear wheels when starting on a slippery or loose surface. Hill Descent Control (HDC) makes it easier to crawl in bottom gear on steep downhill slopes. Using the car's brakes and engine torque, HDC controls the car's speed and keeps it steady at about 10 km/h. This function is activated via a button in the instrument panel. In order to assist the driver when starting on an uphill gradient, the XC70 has a smart, electrically operated Power Parking Brake. The upgraded versions of the Volvo V70 features sharpened versions of the five-cylinder D5 and D3 turbodiesels. In the D5 engine Volvo Cars' engine experts have boosting performance and torque from 205 hp/420 Nm to 215 hp and 440 Nm while at the same time reducing fuel consumption by eight percent. The quest for better driveability combined with lower fuel consumption and less environmental impact has led to increased focus on internal friction inside the engine. The D3 remains at 163 hp and 400 Nm. However, the two-litre diesel engine's driveability is now far improved thanks to fine-tuning of the turbocharger. This is an excellent example of the fact that efficiency enhancement in modern combustion engines is now taking place at microscopic levels. There is also a DRIVe version of the D3, with 163 hp and 420 Nm, a manual and automatic version (engine D5244T17). The improved driving properties of the turbodiesels are accompanied by lower fuel consumption figures for both engines. Fuel consumption in the XC70 D5 is 5.6 l/100 km (149 g/km) in the AWD version with manual gearbox and 6.8 l/100 km (179 g/km) with the automatic. The corresponding figures for the D3 engine with FWD and manual gearbox is 5,5 l/100 km (144 g/km) in the XC70 (DRIVe version). Volvo V70 also comes with a range of petrol engines. The six-cylinder, turbocharged T6 has a displacement of 3.0 litres sharper performance, thanks mainly to a reduction in internal friction. It offers 304 hp and no less than 440 Nm of torque. Maximum torque is achieved between 2100 and 4200 revs. This results in rapid acceleration and smooth driving properties. All-Wheel Drive is fitted as standard. The six-cylinder 3.2-litre naturally aspirated engine was also upgraded in 2010, featuring an improved crankshaft and less internal friction. It offers 243 hp and maximum torque is 320 Nm. In order to meet US legislative requirements, there is also a PZEV (Partial Zero Emission Vehicle) variant that produces 233hp and 300 Nm. The booster cushion, which is integrated in the rear seat, can be set at two heights, allowing children of different sizes to sit sufficiently high to see out through the windows yet at the same time get the most effective protection possible. The lower setting is intended for children between 115 and 140 cm in height and weighing between 22 and 36 kg, while the upper setting is designed for children measuring 95-120 cm and weighing between 15 and 25 kg. The Volvo XC70 can be equipped with integrated child booster cushions in both outer rear seats. Volvo's support for avoiding neck injuries - WHIPS (Whiplash Protection System) - is one of the most effective on the market. In the event of a rear-end collision the front seat backrest accompanies the passenger's initial body movement and dampens the incoming force rather like one's hand does when catching a ball. The XC70 features further developed generation of WHIPS to ensure that the damping motion is gentle and to provide good contact between the head and head restraint throughout the impact sequence. 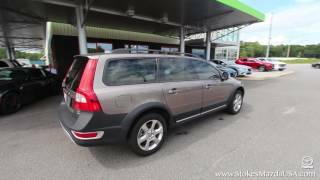 Pedestrian Detection with Full Auto Brake is now also available in the Volvo V70. It is a support function designed to help the driver detect dangerous situations and it can actively help avoid the nightmare scenario of hitting a pedestrian. Rear impacts represent a third of all reported accidents - and in more than 50 percent of these accidents, the driver doesn't brake at all. Collision Warning with Full Auto Brake is a refined warning system that initially warns the driver and pre-charges the brakes. The brakes are automatically activated if the driver doesn't act when a rear-end collision with a moving or stationary vehicle is imminent. One other new feature is that City Safety is standard. This system can lessen the severity of or entirely avoid low-speed rear-end collisions at speeds of up to 30km/h. City Safety keeps a watch on vehicles in front with the help of a laser sensor built into the windscreen at the height of the rear-view mirror. The car automatically brakes if the driver does not respond in time when the car in front slows down or stops - of if the driver is driving too fast towards a stationary object. If the relative speed difference between the two vehicles is less than 15 km/h, the collision can be entirely avoided. If the speed difference is between 15-30 km/h, the speed of impact is reduced to minimise the effects of the collision. Adaptive Cruise Control (ACC) continuously monitors the gap to the vehicles in front and automatically adjusts the car's speed to ensure that this gap does not shrink too much. The latest version operates all the way down to standstill. The car accelerates automatically once the traffic starts moving again.